The Micromax Superfone A84 Elite features 4-inch IPS WVGA capacitive touchscreen display with 800X480pixel resolutions and is powered by 1GHz processor. It runs on Android 2.3.6 Gingerbread OS and the storage can be expandable up to 32GB Via. microSD card. The Superfone A84 Elite sports 5MP rear camera with LED flash and has a 0.3MP(VGA) front-facing web camera. It also comes with AISHA voice assistant application. Connectivity options of A84 Elite includes 3G, Wi-Fi 802.11 b/g, Bluetooth 2.1, GPS with A-GPS and USB 2.0. It comes with standard 1630mAh battery which claims a back up of upto 5Hrs Talktime and upto 160Hrs Standby. The Micromax Superfone A84 Elite comes with a price tag of Rs. 9,999INR. 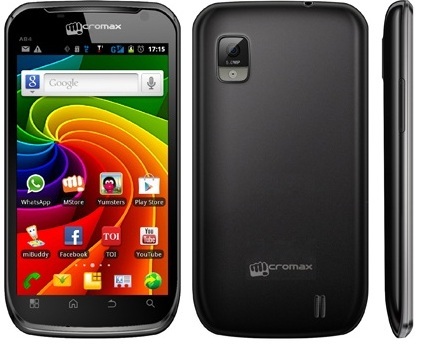 Tags:Micromax Superfone A84 Elite, Micromax Superfone A84 Elite features, Micromax Superfone A84 Elite specifications, Micromax Superfone A84 Elite review, Micromax Superfone A84 Elite details, Micromax Superfone A84 Elite availability, Micromax Superfone A84 Elite specs, Micromax Superfone A84 Elite images, Micromax Superfone A84 Elite pics, Micromax Superfone A84 Elite pictures, Micromax Superfone A84 Elite price.